Swedes are hitting back following a series of far-right violent marches over the weekend which targeted asylum seekers and migrants. Swedes took to social media to hit back after violent far-right groups attacking refugee youths in Stockholm over the weekend handed out flyers and posted online messages claiming they acted to protect “Swedish women”. The hashtag #inteerkvinna (#notyourwoman) was trending in Sweden on Sunday, with women posting pictures of themselves on Twitter alongside messages saying “not in my name”. “I'm not your woman. I don't want your protection. You're the ones making me scared, worried, angry and sad,” tweeted one. “No racist will use me as an alibi to commit their acts of violence,” wrote another. The campaign came in response to a series of violent weekend incidents in the Swedish capital which began on Friday evening when gangs of up to a hundred masked men marched through the city, beating up non-Swedes and handing out leaflets threatening further attacks. The march, the most extreme reaction seen so far to the murder last week of social worker Alexandra Mezher, has been linked to football gangs and far-right groups. 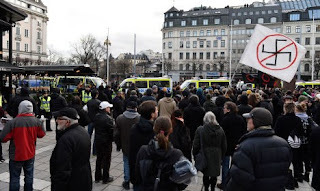 On Saturday there were also reports of violence linked to an anti-immigration protest in Stockholm, where at least three people were arrested for assaulting counter-demonstrators after members of neo-Nazi groups and hooligans gathered in the capital's central Norrmalmstorg square. Meanwhile, refugee teenagers living in the city's 16 homes for teens and underage asylum seekers arriving in Sweden alone without their parents were told to stay inside following the violence. “It's of course sad that we have to do this. But it's still important that we put the young people's safety first,” Alexandra Göransson, social services manager in Stockholm, told the Expressen newspaper. 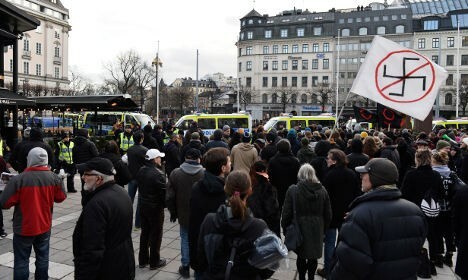 After Friday's attack the Swedish Resistance Movement, a neo-Nazi group, issued a statement claiming that the groups had “cleaned up criminal immigrants from North Africa that are housed in the area around the central station”.